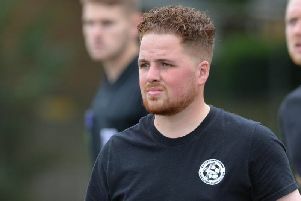 Lutterworth Town manager Josh Dixon admits there might be a few nerves ahead of his club’s United Counties League debut this weekend. However, he insists he has every confidence in his team to succeed at their new level following promotion as Leicestershire Senior League champions last season. It has taken a lot of hard work to reach this stage with non-footballing challenges to overcome before they were accepted into the UCL. And now the big day is nearly here, Dixon says he cannot wait to get going. “I’m really excited now,” he said. “We’ve had six weeks of pre-season and while playing friendlies is alright there is nothing like competitive matches. “Someone asked me the other day if I was nervous. “I told them I’m not because I believe in what we’ve got here and I’m sure we can do well. Moving to a different competition brings challenges in terms of both raising your game and finding out about new opponents. Dixon confessed in the past he knew little about their opening-day visitors Stewarts & Lloyds from Corby. However, the last few weeks have involved plenty of research and he now feels his side are well prepared. “I’ve done as much homework as I can,” he explained. “I’ve spoken to a lot of people and asked about what we can expect. “I also went out and watched games on Friday and Saturday night (the UCL Groundhopping weekend) to try to gauge the standard of the league. “That was a good weekend of learning about things. “Also pretty much every player we have has played at this level before. Despite this knowledge Dixon admits it will take a while for them to work out what the level of their ambition should be. He added: “I don’t know what our target is. “The first thing is we do what we have always done and just try to win every game. “We’ve had a really good pre-season. We’ve played five and won five including games against sides from a higher level than us. “We’ve got a good mix here, we’re tried out some new ideas and still won and we need to keep that winning momentum going into the new season. “As I keep saying it has taken a lot of work to get here. “It’s been a long summer making sure everything is right with the team and also getting the ground so it looks as good as it can. “Now it is the time to start concentrating on getting three points every week and finishing as high as we can.